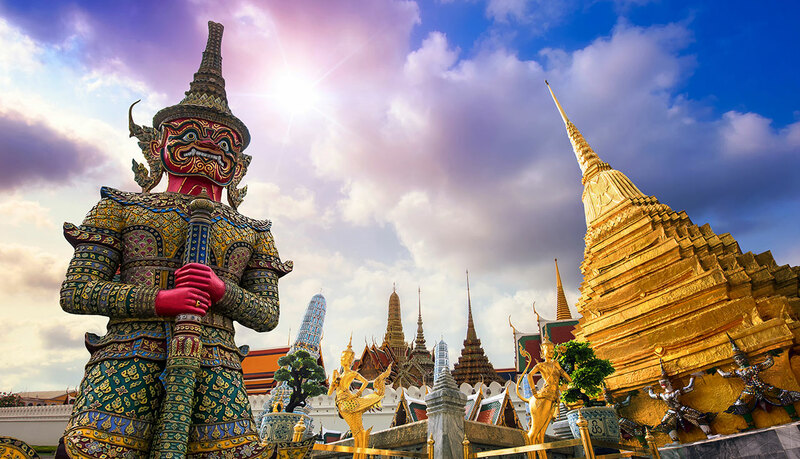 Bangkok is an enormous metropolis with many districts, areas, and sights to explore. The best way to discover Thailand capital is to concentrate on one or two districts or areas per day to enjoy at best the area. 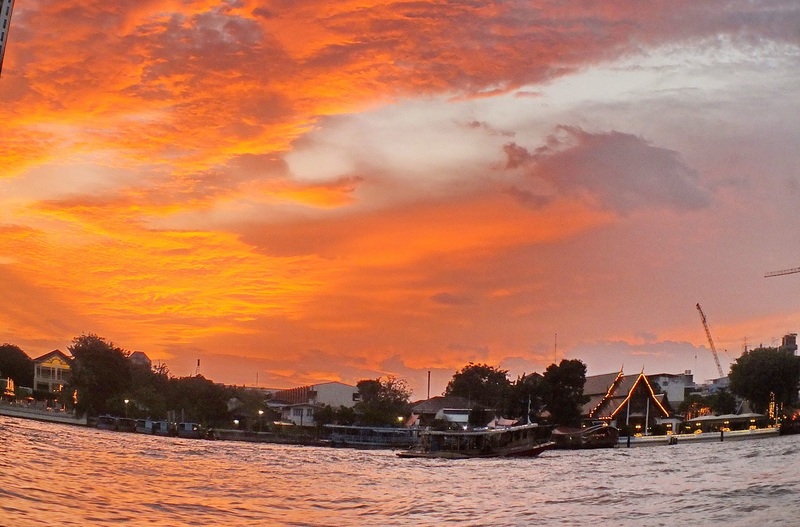 This time, explore the Chao Phraya River and its surroundings. 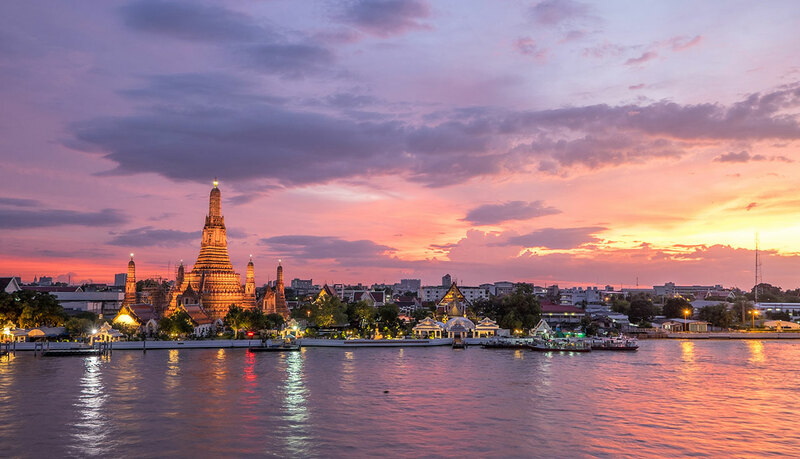 The Chao Phraya is indeed the heart of historical Bangkok and the cradle of its prosperity with any historical buildings testify of the river’s importance. Travel along the Chao Phraya river is easy thanks to a comprehensive public transport system with boats, sky trains and buses servicing the area. 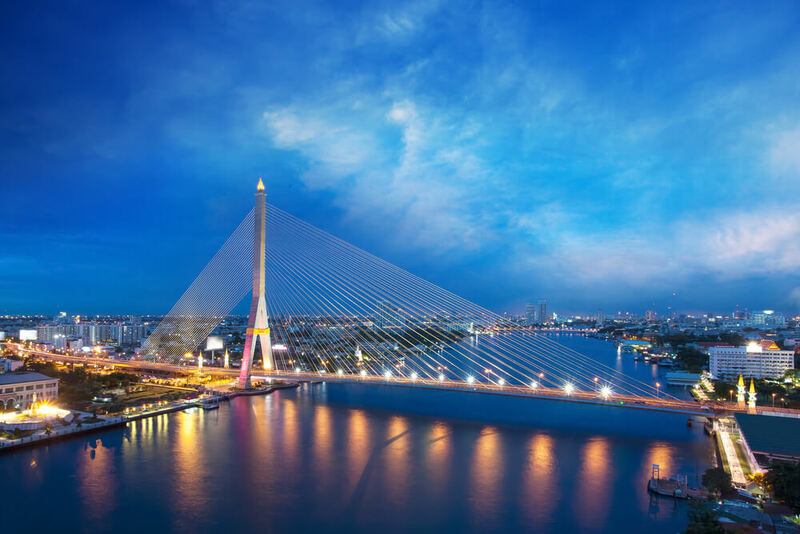 The majestic Rama VIII Bridge with its suspended Cables is one of Bangkok most majestic bridge shaped in a form of a Thai stupa in its middle. It can be crossed by foot or with a bicycle. The bridge passes over the Bank of Thailand with a great view of two European style palaces- BangKhunphrom and Thewawet, mixing rococo and art nouveau styles. Near the Bank of Thailand is Thewet district, home to an old Vietnamese Catholic community. They mostly live around St Xavier Church. Nearby is the charming temple Wat Rachathiwat, which structure was designed by Prince Naris in a Khmer style and Italian artist Carlo Rigoli who painted interior frescoes in European style. Getting there: public boats and public transport are easy to find in the area with public boat services of the Chao Phraya Express stopping at Thewet Pier. 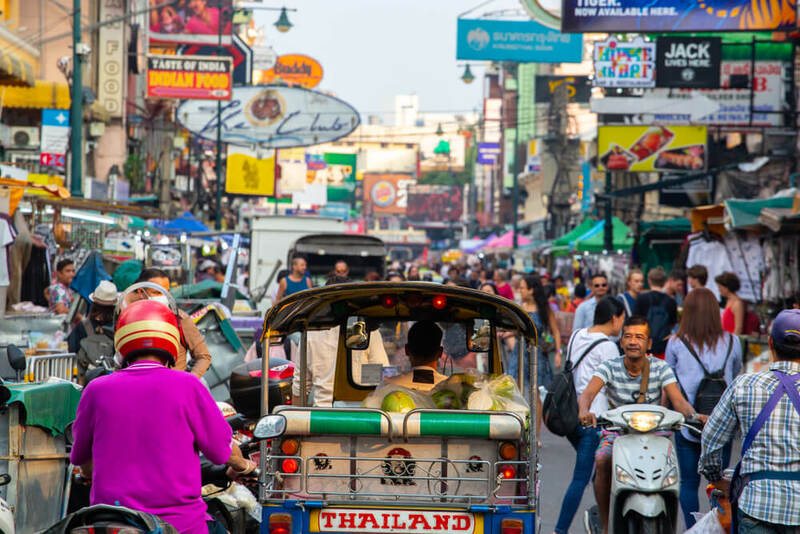 This is probably the favourite area of backpackers in Bangkok, a colourful neighbourhood filled with funky hostels, typical restaurants, a lively market, nightclubs but also quiet temples, art galleries and the remain of the last fortification of Bangkok original town. Khao San Road is busy days and nights with tourists and locals filling mostly the area between noon and late at night. 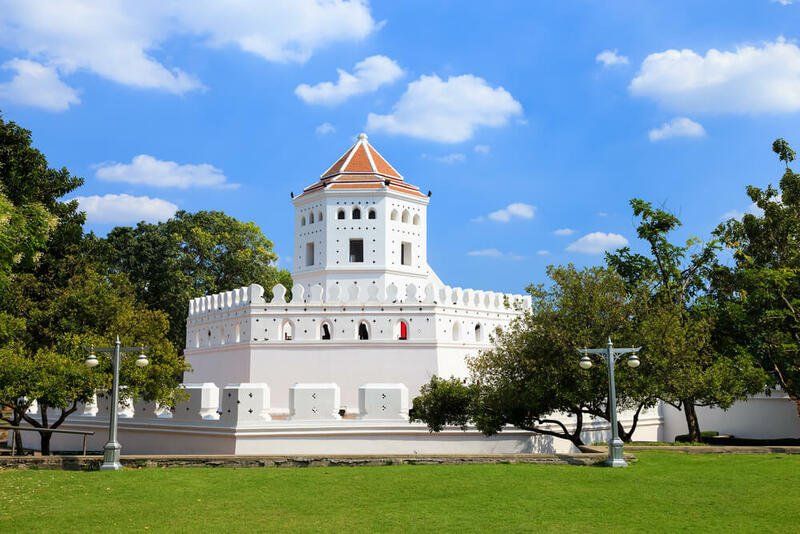 Among the sightseeing, pay a look at Wat Bowonniwet, a temple with charming pavilions in the Italian style, the magnificent Phra Sumen Fort, one of the two last gates from Bangkok fortifications and the gardens inside of Thamassat University, a welcoming green stop after a walk. Getting there: public boats and public transport are easily accessible in the area with the Chao Phraya Express Boat, stopping near to Thamassat University and Phra Arthit Road, near Khaosan Road. Impossible to visit Bangkok without discovering the majestic Grand Palace, the centre of Thailand life since the capital was established here in 1782. The Palace is a complex of various civilian buildings, temples – the most impressive is the temple of the Emerald Buddha Wat Phra Keaw, and gilded stupas constructed between the early 19th century until today, blending Thai, Chinese and European style such as the majestic Chakri Maha Prasat Throne Hall, designed for banquets and ceremonies which has a neo-classical European façade crowned by Thai golden spires. It is a museum today. Queen Sirikit Textile Museum used to be the Ministry of Finance built in the rococo style and has today a wonderful collection of dresses worn by HM Queen Sirikit. Next to the Grand Palace is Wat Pho, built in 1788 and home to the reclining Buddha as well as the famed school of Thai traditional massage. Getting there: public boats and buses are available to go to the Grand Palace with two piers located near to the royal compound. MRT trains should arrive in the vicinity of Wat Pho by the end of 2019. Across the river, facing the Grand Palace stands one of Bangkok most iconic religious structure, Wat Arun or the Temple of Dawn. The shape of the temple with its gigantic prang (stupa) reminiscent of Khmer temples. Wat Arun dates back to Rama II in the early 19th century and was clad with Chinaware during the reign of Rama III. From the prang, there is a wonderful view over the river. Near to Wat Arun is one of Bangkok oldest district, Kudi Jeen, home to a Portuguese community which migrated from Ayutthaya at the end of the 18th century. There are still descendants of the Portuguese Thai community who are living in small houses including a charming museum as well as the Santa Cruz church. 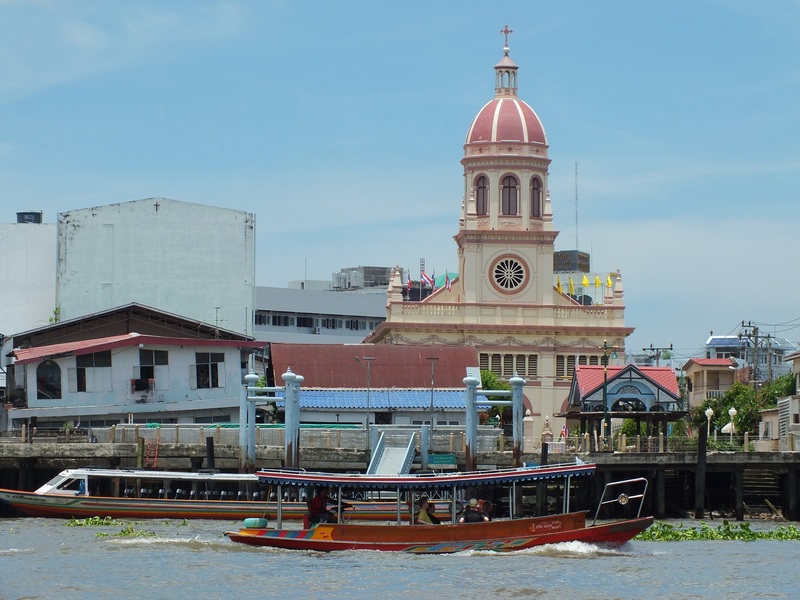 Getting there: ferries are connecting to the public boat Chao Phraya Express near the Flower Market while buses stop in the vicinity of Wat Arun. 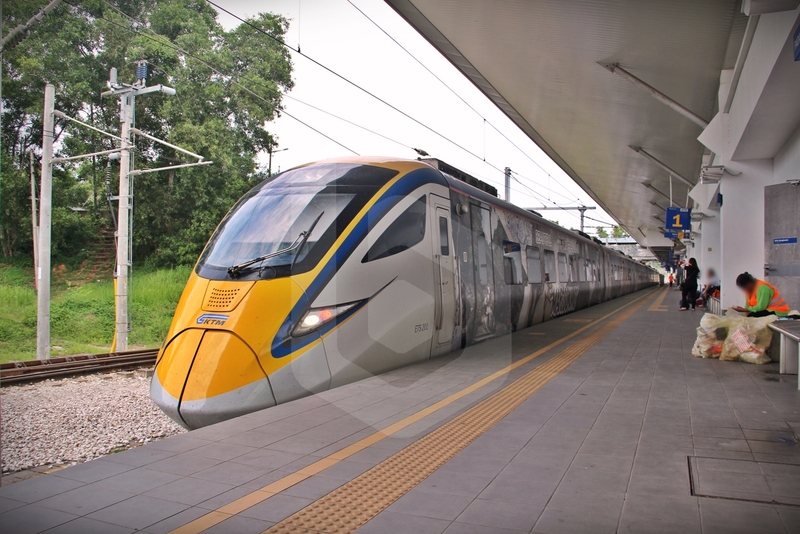 MRT will link the area from 2020. 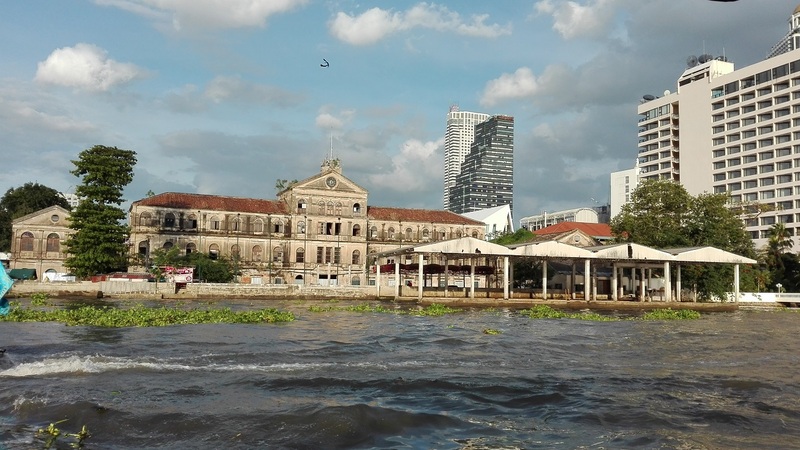 Charoen Krung Road turned into the first trading area for Bangkok with Europeans settling along the road in parallel to the River which was used to reach Bangkok Port. Along the Chao Phraya are many European style structures testifying of the importance of the area. In Talad Noi district are Bangkok two oldest embassies for France and Portugal; the first Thai bank, the Siam Commercial Bank built in Italian style with the Kalawar Church nearby. The Customs House is a magnificent structure in a neo-Palladian style which will be turned into a hotel in the near future. Next to the Oriental Hotel, Bangkok oldest hotel created by Danes, is Bangkok first department store and today the O.P. Plaza shopping centre, the majestic Assumption cathedral with the home of Bangkok bishop and the office of the East Asiatic Company, also constructed in European classical style. Getting there: Chao Phraya Express boats stop at River City to visit the area. Hua Lamphong main train station is nearby as well with good connections to the MRT and bus system. Last but not least, what would be Bangkok without any shopping? True that this is not compulsory but there is so much to enjoy to buy in this town from local designers to handicraft and international brands. Three shopping areas are linked by boat as they are located along the River. Facing River City and the former Central Post Office (currently Thailand Creative and Design Center) is Bangkok newest shopping mall, Iconsiam. Iconsiam is a massive luxury mall with over 500 shops, restaurants, a park along the river, a light and water show. Especially, Sook Siam is a food court presenting in a recreated traditional village food specialties and handicraft from the 77 provinces of Thailand. They are some great view of the Chao Phraya from the top floors. A bit more unusual is Lhong 1919, a 19th-century Chinese mansion that has been fully restored and re-opened with art galleries, craft shops, and a few restaurants around a large shrine dedicated to Mazu, the Chinese goddess of seafarers. A charming place to enjoy old Chinese life of a gone era. Another historical area has been turned also into a shopping attraction. Asiatique the Riverfront is located where Bangkok historical port used to be. Today, it is a popular venue with a Ferris Wheel, old warehouses turned into restaurants, craft shops as well as the new location of Joe Louis Puppet Theatre as well as Calypso Cabaret with its beautiful drag queens bringing alive every night Lisa Minelli or Madonna… A great place to finish a day along the River! Getting there: free shuttle boats are available from Saphan Thaksin/Sathorn Pier to the three attractions. The most common way to come to Bangkok is of course flying. 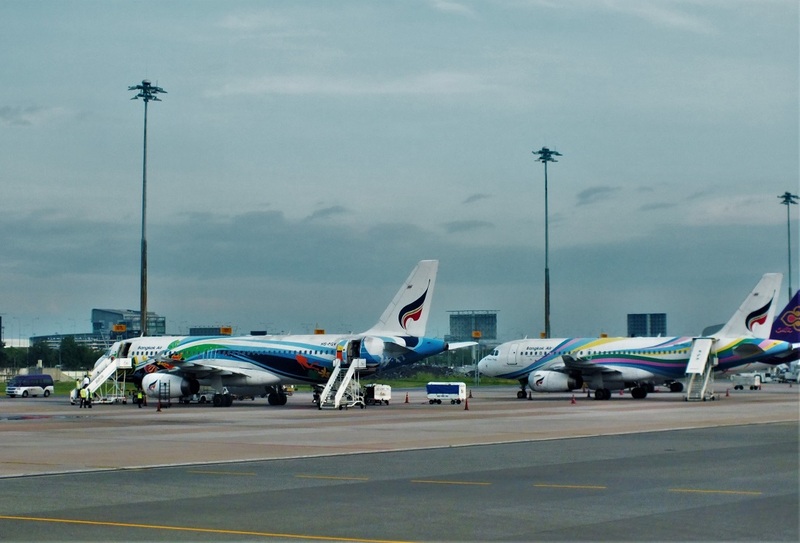 The Thai capital is connected to many primary and secondary destinations in the region via either Don Mueang or Suvarnabhumi airports. Cruise boats, circuits also link Ho Chi Minh City and Sihanoukville to Bangkok port. Reserve your e-ticket with Baolau to travel to Bangkok without hassle.